Saturday all 28 students (minus one sickie), plus Kelley and Josh boarded the train for Neuschwanstein Castle. It is located in the foothills of the Alps which divide Germany from Austria. This outing is a perennial favorite for AMBEX, and our Spring 13 AMBEXers thoroughly enjoyed the experience. The castle was built in the late 1800's by "Crazy" King Ludwig II of Bavaria. As far as castles go, it's not very old, but is still rich in history. The king was declared mentally insane within the walls of this castle. He was forced to abdicate the throne and mysteriously drowned just a few days later. Due to his early death, the castle remains largely incomplete on the interior. Only 16 rooms are finished! The swan was a symbol of Ludwig's royal lineage, and as such, swans are the major theme of the castle's interior. In fact, the name Neuschwanstein means "new swan stone." Ludwig spared no expense in the design and decoration of his third castle. The king was a devoted fan and personal friend of Richard Wagner, the famous operatist. Many murals depicting various stories from the operas adorn the walls of the castle. 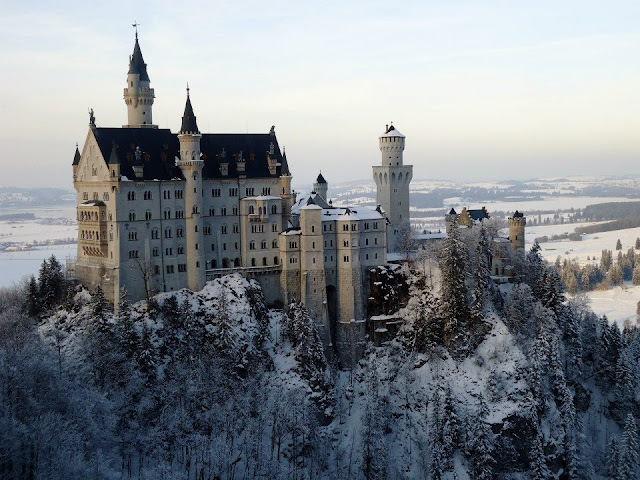 A final interesting note about Neuschwanstein: Walt Disney studied this castle closely when designing his own Sleeping Beauty Castle found in the Magic Kingdom parks! Perhaps the most iconic design borrowed by Disney is the "double tower," the tallest part of both castles. On the bus, almost to the castle! View from the village at the bottom of the mountain. Traditional group jump shot in front of Hohenschwangau, King Ludwig's parents' castle, where he grew up. View from the Marienbrucke, a bridge which spans the valley behind the castle. Group shot from the observation platform right below the castle gate. This is the front side of the castle. View from the castle looking down. Alpsee (the lake) is mostly frozen over! On Sunday night, we were blessed to experience a Scottish tradition: Burns Night. Robert Burns is the national poet of Scotland, and each year, on or around his birthday, the Scots have a traditional dinner in his honor. I believe this year Mr. Burns turned 254. Anyhow, we went to the local Evangelical Student Union, took part in a little church service, and then partook in the festivities. We had real haggis (vegetarian), potatoes, turnips, and trifle for dessert. Some real Scots guided us in the reading of a few of Robert Burns' poems in Scots dialect, along with a brief biography! The night ended with a toast to Mr. Burns and his contributions to Scotland and to poetic literature. It was a wonderful time for all those in attendance; we are thankful to the church members who spent all day preparing our feast. One half of our merry group. And there's the other half! Rhona, the lady at the front left, was the reigning Scot at the event. Well, as Porky Pig so eloquently says, "That's all, folks!" For now anyways. :) Thanks so much for checking in, and remember to keep our 28 students, 4 staff, and many professors in your prayers. We'll be back with more adventures soon. Tschuss! Oh wow. 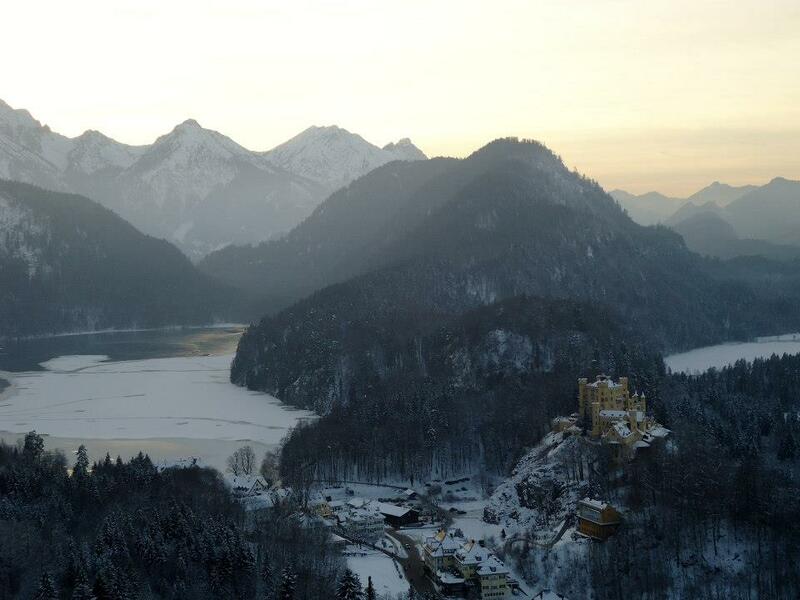 The alps and Neuschwanstein covered in snow are a magnificent sight.